Under the Direct Entry Scheme, introduced by ICAI with effect from 1st August 2012, students who have cleared their graduation with a certain percentage of marks are exempted from clearing CA-CPT/ Foundation (the entry level CA Examination). They can directly appear for CA-Intermediate (earlier known as IPCC). Let’s elaborate the criteria given by ICAI, and understand it better. 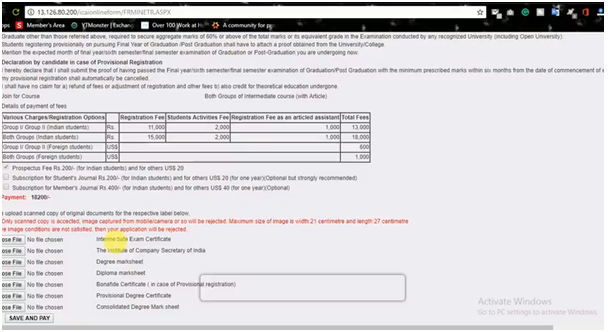 If you are a commerce graduate/postgraduate who have studied at least 3 subjects among Accounting, Auditing, Mercantile Laws, Corporate Laws, Economics, Management (including Financial Management), Taxation (including Direct Tax Laws and Indirect Tax Laws), Costing, Business Administration or Management Accounting (or subjects similar to the title of these papers with different nomenclatures), and have secured a minimum of 55% in aggregate; you can apply for direct entry to CA. The degree procured by you must be from a recognized University (including Open University). And the aforementioned subjects must have had the minimum weightage of 50 marks in a semester/year and cumulatively 100 or more marks over the entire duration of the concerned course. For a non-commerce graduates/postgraduates, on having completed your degree from a recognized University (including Open University) and upon securing minimum of 60% in aggregate; you will become eligible for direct entry to CA Intermediate. Additionally, students who have passed the Intermediate level examination conducted by The Institute of Cost Accountants of India or by The Institute of Company Secretaries of India can register directly for CA Intermediate. They too are exempted from appearing for CA-CPT/Foundation. If you in the final year of graduation, you can register for the Intermediate Course on provisional basis. However, this does not imply that you automatically become eligible for direct entry to CA-Intermediate. Your registration will only be considered valid if you submit satisfactory proof stating that you have cleared graduation examination with the percentage of marks as specified above. This proof (a.k.a. 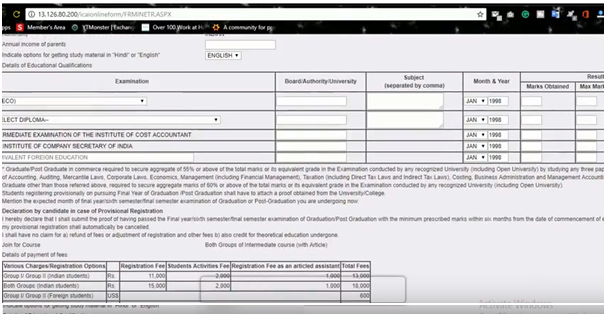 your statement of marks reflecting your aggregate score in graduation) must be provided within six months from the date of appearance in the final year of graduation examination. After that, you can continue with proceed to commence practical training and go on to complete ICITSS (Information Technology (IT) and Orientation Course (OC)). 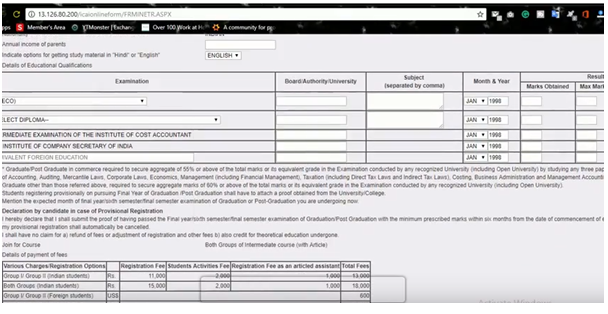 During the provisional registration period, you can choose to undergo and complete the same training but if you fail to produce the graduation pass certificate with specified percentage within six months from the date of the commencement of the final year graduation exam; your provisional registration shall stand cancelled. Under such circumstances, the registration and other fees paid by you shall not be refunded/ adjusted, and no credit shall be given for the theoretical education undergone. Students registered for Intermediate from CPT/Foundation who now want to switch to direct entry mode can anytime apply for the same by paying off INR 500. They will not be given study material as they are already registered under the new course but the route will now change where they will now directly start articleship. IPC students (old course) through CPT and Old Foundation course can also convert to new course by paying INR 1000 where they will get study material for free for the new course. But if the student is registered under old course for only one group, he/she will have to get himself register under new course for the balance group. It may happen that you had earlier registered with ICAI for CPT/Foundation but have not managed to clear it yet. But in the meantime you have cleared your graduation, and as per the eligibility criteria mentioned above for commerce graduates, you may deem yourself fit to apply for CA-Intermediate via the direct entry route. In such an instance, you can register for Intermediate Course through Direct route any time by paying the Intermediate Registration fees only. 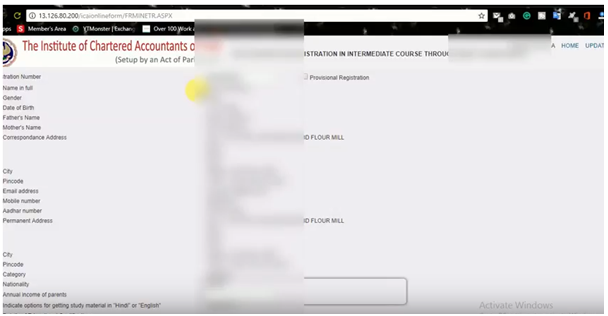 Candidates have to register for Intermediate Course under both routes by filling Online Registration Form available on ICAI website (www.icai.org) in “Course Registration Forms” under “Students tab” or through “E Services” Tab on ICAI dashboard. Direct Entry to CA Step 1- Create Your Login ID if you are never enrolled with ICAI using their online portal. If you already have an account, use your existing login ID credentials. Direct Entry to CA Step 3: Check the details available and fill in the other required information like: annual income of parents, study material required in Hindi or English, educational qualifications and lastly if any subscriptions are required for student’s journal or member’s journal. Direct Entry to CA Step 5: Print the auto generated form and send it to the Regional Office of ICAI along with the necessary documents. Following documents are to be submitted to the concerned Regional Office within 7 days of the date of online registration along with the print out of the online registration form, duly signed by the student. a) Direct Entry Route students have to submit attested copy of Graduation / Post Graduation mark statements/marksheet of Intermediate level examination of the Institute of Company Secretaries of India or the Institute of Cost Accountants of India. c) Attested copy of proof of Nationality, if student, is foreigner. d) Attested copy of proof of special category certificate i.e. SC/ST, OBC, Differently abled. 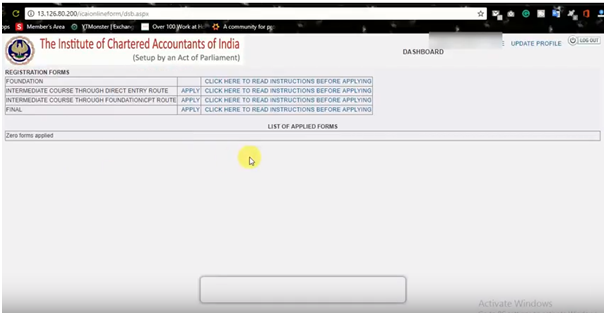 Note: If you want to print the form later, just login from any computer attached to printer, and the list of application forms you have filled applied will be reflected on your dashboard along with status and form acknowledgement number. If you click on the acknowledgement number, the form submitted by you will be displayed (of which you can take a printout and submit to the ICAI Regional Office).